The burning of fossil fuels, like the API's cherished natural gas, oil, and derivatives like gasoline, "could" cause climate change, which in turn "could" destroy the livability of the Earth for millions of years. The API insists that none of this is proven, and touts its own "studies" (of dubious scientific rigor) to claim that they should be able to explore, drill, produce, sell and use their product without interference from the EPA or anyone else. It's quite ironic, even if the API is too self-absorbed to see it. The biofuel makers insist their product is safe, produce their own studies supporting their view, claim the virtues of job creation, tout their contribution to economic growth, and remind anyone who will listen that their industry lessens our national dependence on foreign energy sources. Such patriots! They sound just like the API talking about oil and gas. Of course, it's an entirely different question about whether ethanol, made from corn, is a good idea. Using a food crop isn't good policy, the subsidies look mostly like welfare for agribusiness, and it has a poor sustainability story. 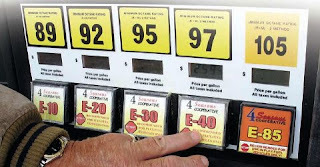 Ethanol may be a scam, but neither side exactly covers themselves in altruistic glory as each single-mindedly pursues their own naked self-interest. The API argument is cloaked in consumer-friendly bon mots, but the underlying allegiance to Big Oil first cannot be hidden. (They could learn a trick or two from the NRA.) Once again the API undermines itself by using ad hoc standards of argument; the inconsistency highlights the enduring constancy of their position—regardless of all else, drill more, drill now, drill everywhere. Shill, baby, shill.